This Pretty Posse set was sold during Sephora Canada's Boxing Day sale for $15. 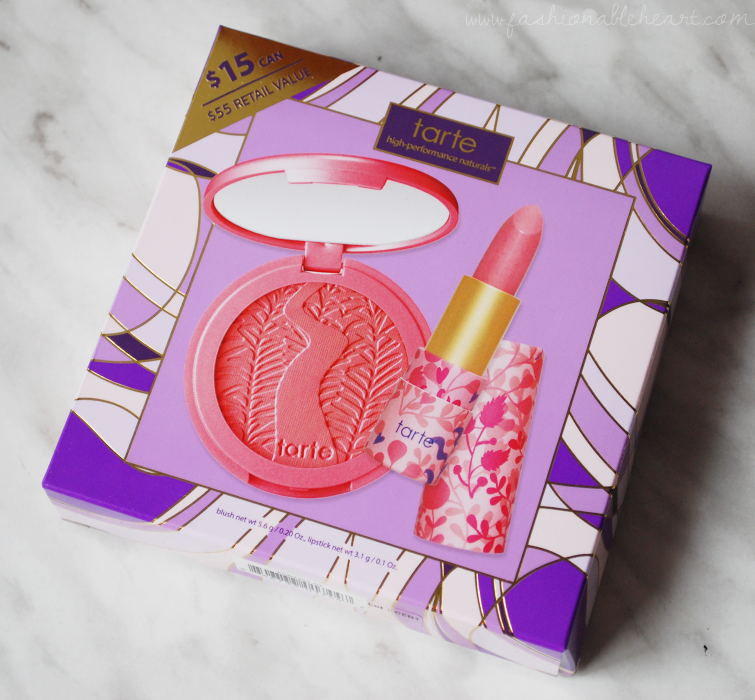 For two full-sized Tarte products. I repeat, $15 for two full-sized products. I bounced on that faster than you can say "Amazonian clay"! I thought the last Tarte deal on Black Friday was pretty good, but this one topped that one and blew it out of the water. This set is no longer available, but the products are. Here are my thoughts and swatches on the Amazonian Butter Lipstick in Golden Pink and the Amazonian Clay 12-Hour Blush in Tipsy! 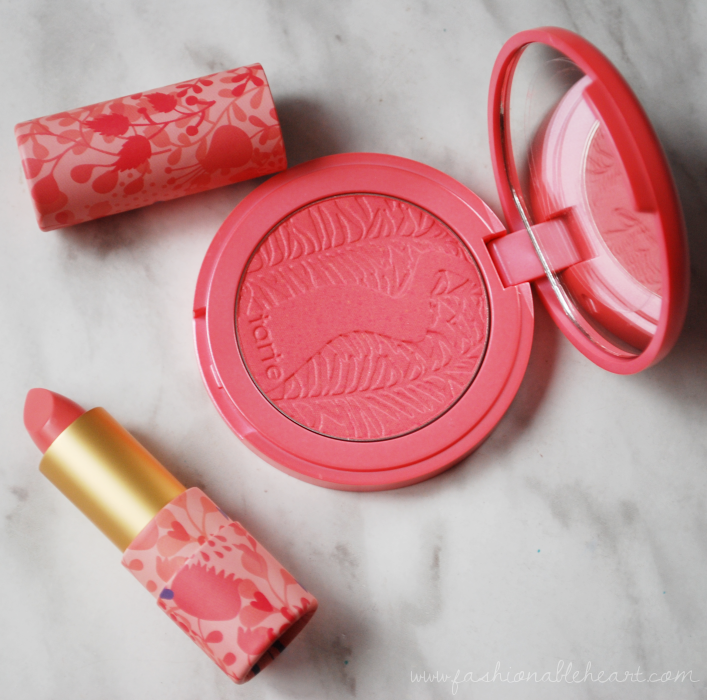 The Amazonian Butter Lipstick in Golden Pink is gorgeous from the color to the packaging! It has that same peppermint smell that the Tarte LipSurgence line has. Maybe because it even has "Butter" in the title, but the formula reminded me a lot of my beloved Korres Lip Butters. If you're looking for a huge color payoff, I don't think you'll find it in these even in the darker shades. I'm really happy with this one, because it is a shade that I definitely would have picked for myself. It's easy to apply and has a glossy finish. It feels hydrating on the lips and doesn't feel sticky. I think this one works for me because I have fair skin. I doubt you'd see much of anything if your skin is darker due to its sheerness. I'm loving the creamy formula and would not be opposed to picking up another color in the future. The Amazonian Clay 12-Hour Blush in Tipsy doesn't seem to be listed on Sephora right now. 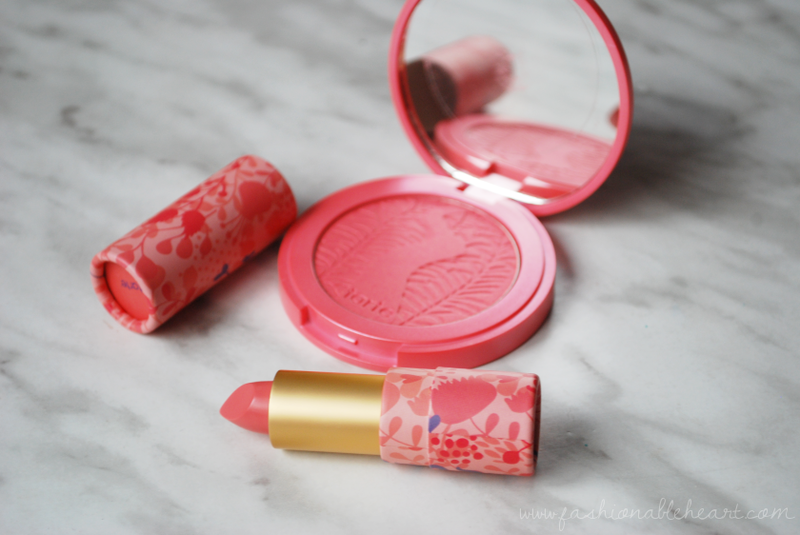 It's a pretty coral blush, a color that I don't have a lot of in my blush collection. I'm a little terrified of coral blushes and coming off looking like a clown. But this one is pretty easy to sheer out and not overdo it. I think this color could work for a number of skintones as it is quite pigmented. These blushes work well with my dry skin and don't accentuate any dry patches I may have. For me, they do last all day which is great because I might as well be allergic to touch-ups. The less I have to worry about fixing, the better. I see why they paired the two of these products together in this set, because they do compliment each other. I can't see myself wearing this that often, as I prefer lighter blushes but I am happy to have it in my collection for days that I want a little more color! Have you tried either of these formulations or shades? Let me know what you think!